Punk Pop Garage is universal. 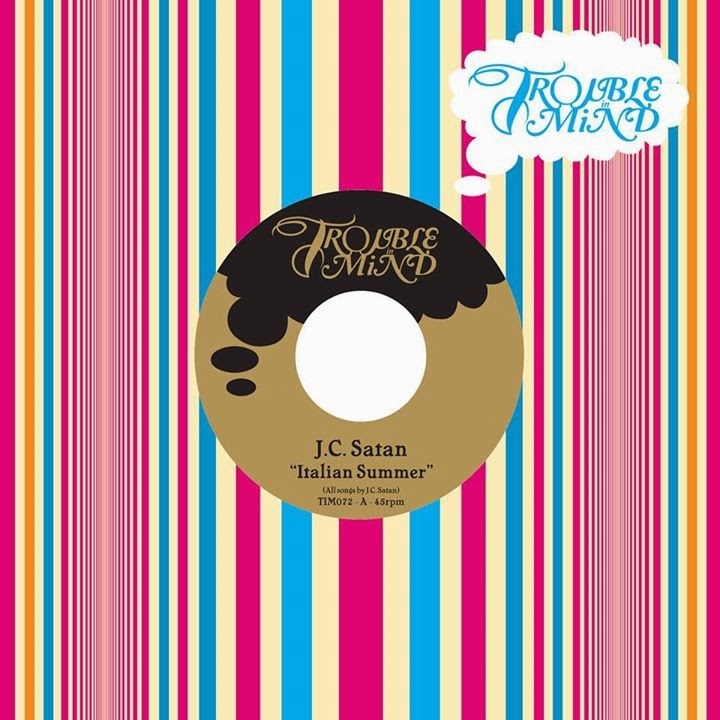 From the Australian bubbly scuzz I’ve been hearing from UV Race or Eddy Current Suppression Ring to this layered thick fuzz Ty style punk from Los Dos Hermanos or this latest single out from fellow frenchman JC Satan on Trouble in Mind Records. This sound isn't the product of some local scene. Getting back to stripped down unpretentious roots is being done all over the world and is easily crossing borders with sounds like this. A-Side's "Italian Summer" has a thick, open space tom with a tambourine just underneath that cracks open into a hard pop psych. Layered doubled up vocals stepping on each other over a hyper stylized warbling electric coming from the upper left of this sonic room. There isn't possibly enough space for this to spread out though, the gasping riffs take over for a measure or two but this has all the kaleidoscopic feeling of the Resonars or Jacco Gardner with even more elements. Even more experimental trials just under the surface. It's definitely not adhering to the traditional kind of psych or pulling from those historic tested sounds. Picking this thing apart is where it gets fun, the number of acoustics and open mic'd cigar box guitars with all the different depths all working with and against each other. This is some kind of sparkling gutter psych that feels like it has more to do with Ty or White Fence then the '60s stuff. B-Side's "I Don't Feel Like Dancing" opens on the best tom sound, that tight whack in a polished room, the echo off the walls with synth style guitar riffs are just the right type of pop for this rhythm. They can hardly contain themselves becoming a Bass Drum of Death kind of power and density here. This has just completely crossed the line having very little to do with the psych I thought I was hearing on the A-Side. Unless it's completely crossed into more of a Captain Beefheat weirdo with slices of guitar coming together unpredictably and impossibly. They commit to a reckless chaotic sound that keeps landing on the beat somehow, it's classic rock and swirly pop, a tough combo to balance and I'm still not sure where this fits into my idea of Trouble in Mind and that's why it's great. They just expanded on what the label is known for while being at home alongside real idiosyncratic talent. The first edition of the “Italian Summer” single comes housed in the Trouble In Mind factory sleeve, is pressed on randomly mixed vinyl, includes a download code & is limited to 500 copies!